I love getting my hands on new cigars. I love it even more when it happens to come from one of my top five favorite brands on the market. Tonight's cigar is the first new full line release in 2011 from Pete Johnson's Tatuaje brand, the Tatuaje "The 7th Capa Especial". What makes this different from previously released "Tatuaje 7th" is this stick is wrapped in a Sumatra leaf. Pete and the whole My Father company (who make Tatuaje cigars) have been using a lot of Sumatra lately, so it only seemed fitting that one of the core Tatuaje sticks would eventually be made with this wrapper. The 7th Reserva was my number two cigar of the year last year, so I was very excited to smoke this rendition to see how it tasted. Something to note: This cigar is made at the My Father factory in Esteli, Nicaragua and not in Miami like most other brown label Tatuaje cigars. The wrapper on my Tatuaje 7th Capa Especial was a rustic medium brown color with a decent amount of veins running all over the stick. The veins were smoothed down nicely, but still very apparent on the leaf. The new white band added to the stick looks classy and adds a bit of interest to the simply stated brown band that we are all accustomed to. 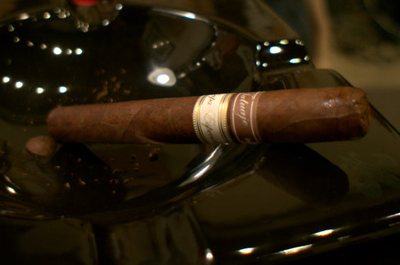 The pre-lit aroma of the cigar was very bread-like, with some hints of sweetness. Not strong fresh baked bread, but more of a raw whole grain smell. The cold draw mimicked the pre-lit aroma and had a heavy bread flavor that sat thick on my palate. I lit my Tatuaje 7th Capa Especial with a soft flame lighter and was greeted right away with the classic black pepper spice of a Pepin blend. The spice was so strong that it tingled the sides of my tongue and was apparent in the back of my throat. The finish of the profile was very interesting because after exhaling the smoke the pepper seemed to mellow out, but a minute later between puffs the pepper came right back. The smoke itself is very thick and coated my taste buds from the first puff. The draw was perfect and the body sat in the medium to medium full range. Burning into the second third of my Tatuaje 7 Capa Especial the flavor profile really changed. The finish was still dominated by the black pepper, but the front now had a very strong nutty flavor mixed in with some obvious graham cracker. I described it to my smoking partner as not a sweetened graham taste, but a raw bread-y graham. These flavors mixed nicely and added a great change up from the pepper power from the first third. The finish was still long in flavor and I could taste it well-over the sitting time I normally take between puffs. Moving toward the end of the second third, the body started to pick up also and moved into the full range. Again, no problems with the burn/draw/construction. The final third of my Tatuaje7th Capa Especial was similar to the second third except the pepper started to pick back up again on the front of the profile and the finish now had a butter characteristic to it. It's worth mentioning again that the smoke of this cigar is very heavy and feels like you could chew it. Another thing to note in the final third was the strength of the cigar went well into the full range. By the end I could really feel it in my system and had my head spinning just slightly. 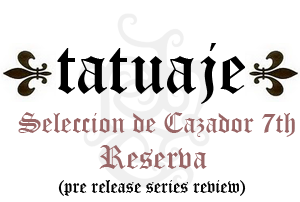 My final thoughts on the Tatuaje The 7th Capa Especial? 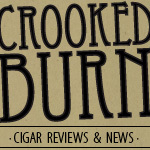 This is a solid, complex cigar with lots of flavor and the strength to back it up. The cigar to me tasted completely different from anything else in the brown label line from Tatuaje. I hear people all the time say they shy away from Sumatra wrapped sticks. 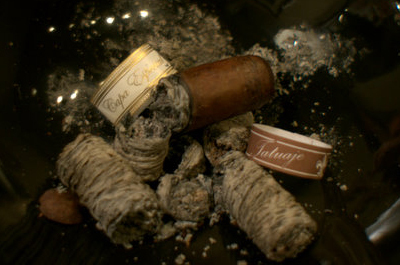 I will point out that most people say the same thing about Connecticut shade-wrapped cigars, but we have seen that leaf gain great popularity recently with the EPC New Wave cigar. Maybe the Tatuaje Capa Especial can do the same for Sumatra? I think it can. Would I buy it again? I absolutely will buy more of this cigar because it is just that much different than other sticks in the brown label and will be a nice change up. I smoke A LOT of brown label, and I see this one being added to my rotation. Would I buy a box? I could see myself going for a box of these to sit on because I have no idea what this wrapper will do to the blend with age. They are smoking great ROTT, but some age intrigues me. I got my cigars from Dan (NHCDAN on twitter) at New Havana Cigars. When I left his shop he still had a small amount of these left for sale on his site. They are a full release cigar, so I am sure there will be at some time be plenty to go around. If you want some now though, I'd not waste any time.